You know how I was hoping (wishing/ praying) that Steve Orlando would deliver with Justice League of America since Hitch’s Justice League is complete crap? Yeah, well… Orlando totally failed in that mission! What in the hell did I just read? Everything about this issue feels off. The quality of Orlando’s narrative plummets. The characters feel generic and interchangeable. Most of the plot progression is convenient. The change in art is disappointing. The action is difficult to follow… This issue is nothing more than a mess of unwarranted reactions and outcomes. When we last left Batman and team, Lord Havok and his generals had beat the Justice League of America into submission. Havok had the Atom in a death grip, and Batman offered to take Ryan’s place. In this issue, we pick up in that moment. Batman continues to negotiate his life for Ryan’s, but Havok has his own ideas. 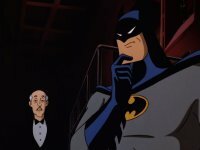 I kept waiting for Batman to reveal his plan, but it never came. Instead, Batman kept offering himself up in some form or fashion – death, join Havok – anything to save his team. I continued to wait for that “moment” where Batman reminds readers how awesome he is, but it never came. In theory, I like the direction Orlando takes the plot, but I don’t like how he executes it – nor do I like the characters’ motivations… Mainly because there are none. What’s bad, is that Batman and Dr. Diehard are just the beginning of these issues. The more you read, the more convenient, head-scratching plots you encounter. They just begin to build on top of one another. I expect more from Orlando, and am somewhat shocked I’m encountering such generic, lazy storytelling from him. There are basic, fundamental questions you should ask yourself when writing: who, what, when, where, why, and how? The why and the how were completely missed while setting up this story… And that’s a total shame. After this issue, I can’t help but feel that Justice League of America’s potential was just flushed down the toilet. The Art: First off, I want to openly admit that anyone following Reiss in art is going to have incredibly large shoes to fill. I want to acknowledge that because I’m about to knock Felipe Watanabe’s art, and I’m certain that a chunk of my dissatisfaction stems from a comparison to his predecessor’s work. But even beyond comparison, Watanabe’s art is inconsistent. Some panels look good, and with Hi-Fi’s colors, don’t look like a complete departure from the art that came before. Then there are panels where the renderings look awful and rushed. And this happens quite often. Expressionless, wide-eyed faces also plague this chapter. There’s potential in Watanabe’s art, but potential just looks bad when it follows greatness. Batman. Batman offers to sacrifice himself. I was certain he was working an angle. I mean, he wouldn’t just give up and die that easily. That’s not to say that Batman isn’t heroic or noble, it’s just that this is freaking Batman! He’s not going to give up after a minor scuffle. He clearly has some type of master plan, and he he’s waiting to act… Right? Wrong. He apparently was throwing in the towel after hardly any effort in trying to overcome the obstacle. Kudos to Canary for calling Bats out about it though. Dr. Diehard (AKA: Wannabe Magneto). We all know that one person that is extremely zealous and brash. You know who I’m talking about. That one guy/ girl that always jumps to conclusions, and when the situation warrants a level 3 reaction, they blow up to level twelve… That’s Dr. Diehard. He loses it when Havok starts negotiating with Batman about the lives of the rest of the League, decided that was a bad move, and attacked everyone. Clearly he didn’t think that assault through very well. Home. I’m so confused… Orlando established that Havok is from another planet, and that, that planet was destroyed… But then after fighting off the JLA (and Dr. Diehard), he and his men teleport “home.” Home, in this case, is the fictional country, Kravia – at which point Havok proclaims to be from here… So… Which one is it? Leader. So… In what appears to be a day (or at the most, a few days), Havok completely takes over a country, and does so thanks to the country’s citizens… Yeah… Sure… If you say so. You’ll read anything with Batman. You don’t want/need the details of a plot, you just want the big moments. Overall: The second chapter of Justice League of America is disappointing. I can only hope that it’s a temporary stumble, but considering how negatively this issue impacts the foundation of the arc, I can’t imagine future issues being much better. Also, while I found myself getting caught up in the initiation of this team – mainly because of the characters – I’m going to need a justifiable reason for this team to exist. More importantly, I’m going to need a reason for them to be called the Justice League.